This early medieval surname is English, although perhaps with a dash of Viking. It was originally either topographical for someone who lived near a prominent hazel tree or farmed hazel nuts for food, or locational from one of the places whose name means hazel. These include towns and villages formerly under Viking control such as Hessle, of which there are two examples in the East and West Ridings of Yorkshire, or Heazille Barton and Heazle Farm, both in the county of Devonshire. Early examples of recordings include Hugh de Hesill in the Assize Court rolls of Yorkshire in 1204, and William atte Hasele in the Subsidy Tax rolls of Worcestershire in 1275. 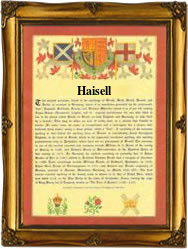 The various surname spellings include: Hazel, Hazael, Hasel, Hasell, Haisell, Heazel, Heazell, Hessel, and possibly others. Other examples of recordings in the surviving church registers of the city of London include the marriage of John Hasell to Margaret Rownde on December 2nd 1553 at St. Margaret's Westminster, and the christening of William, the son of Thomas Hazell, on April 18th 1593 at St. Botolph's, Bishopsgate. The first recorded spelling of the family name is shown to be that of Alured del Hesel. This was dated 1182, in the pipe rolls of Worcestershire, during the reign of King Henry 11nd of England, 1154 - 1189. Surnames became necessary when governments introduced personal taxation. In England this was sometimes known as the Poll Tax. Throughout the centuries, surnames in every country have continued to "develop" often leading to astonishing variants of the original spelling.